Ghibli was in the news for making debut in near future, but is it the same in this teaser image? Maserati was very much vying to launch Ghibli soon somewhere at a good platform, for beginning the sales point in 2014 and we think there is no better place than China, as that Asian territory had excelled last year in the luxury car sales, taken over even major markets of the world. Lest of all, we are here to inform that Maserati had teased a new model in the freshly released teaser image, which is a complete story in itself. Long hoods and the fastback design inclines us towards those golden era of past where some of the resemblance can be made to 1960’s Ghibli model, and but obviously the bigger nose with all those gigs on front are placed from the present generation Quattroporte. Meanwhile the metal is still under cover therefore no further derivation on the tech specifications and other such, instead waiting for sometime will definitely reveal more of it very soon. Till then one can enjoy those blue covering with company’s trident logo on its forehead. As in the latest, Maserati had announced to make Ghibli in the combination of past and future, so definitely it will be interesting to see whether the carmaker is able to stand perfectly on the paddock where it has directed itself. Though it requires a lot of patience to make ourselves wait for these moments in life, and thus we also trust this Modena based automaker on an exclusive note for such type of commitment. 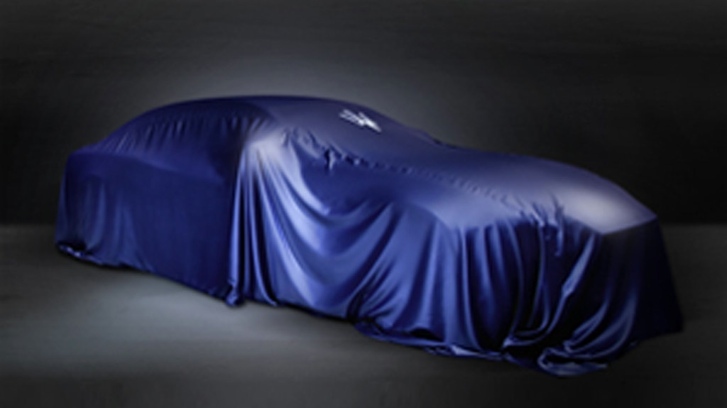 Lastly, the covered vehicle is scheduled for 2013 Shanghai Auto Show and the date specified is 19th April 2013 for unveiling, Cheers to all the Maseratians!